IT’S just as well he had a pretty thick skin, for had he not the world quite possibly may never have known Elvis Presley. Because while teens crammed into sell-out venues at which he gyrated almost bizarrely around the stage to their screaming and yelling, when he first appeared on TV his pelvic gyrations were slammed by older critics as overtly sexual and bordering on obscenity – one network even ordering that he be filmed only from the waist up. 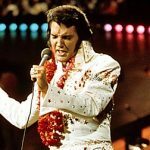 Ironically Elvis Presley had no formal music training, could not read music, and his school music teacher described him as having no aptitude for singing – so much for the eventual King of Rock ’n Roll, whose sales of 1.5 billion records and albums world-wide made him the biggest selling solo artist of all time. 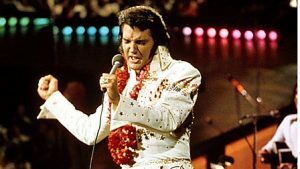 ELVIS Presley belts it out in concert. Despite being slammed variously by critics as unspeakably untalented, vulgar, bordering on obscenity, and an assault to the senses, he sold 1.5 billion records and albums world-wide.